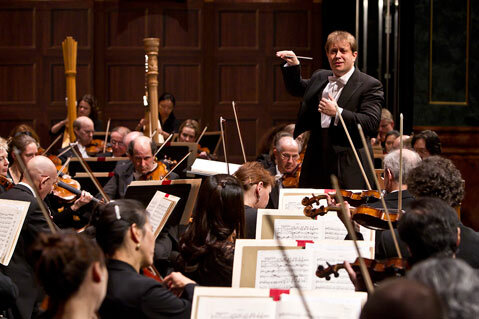 Maestro Ludovic Morlot is conducting the Boston Symphony Orchestra on its tour of California. Over half a century has elapsed since the Boston Symphony Orchestra (BSO) last played Santa Barbara, and thus the level of anticipation among concertgoers was high as one of the world’s most prestigious orchestras took the stage at the Granada last Thursday night. Minus the legendary maestro James Levine, who has been battling health issues for much of 2011, the orchestra nevertheless sounded powerful and lush under the baton of conductor Ludovic Morlot. The Roman Carnival Overture, Op. 9 of Hector Berlioz made a suitably grand introduction for the group, emphasizing the technical prowess of the BSO in creating precise and intricate sequences of orchestral color and timbre. The BSO and Berlioz go way back, and the inclusion of this work on the program was one way that the orchestra demonstrated its commitment to continuity. The other way that they connected with tradition was through the appearance of pianist Richard Goode, a faithful interpreter of Mozart, for the composer’s Piano Concerto No. 25 in C Major, K. 503. Once seated at the instrument, Goode entered the music making with a brilliance and authority that immediately announced the presence of a true believer. His control and the subtlety of his playing suited the empyrean perfection of the composition — even if the orchestra was not always on the same heavenly level of execution for this devilishly difficult work. After the intermission, the orchestra returned for two classics of the modern repertoire, one thoroughly established — Richard Wagner’s “Prelude and Liebestod” from Tristan und Isolde — and the other an emerging staple, Béla Bartók’s Miraculous Mandarin Suite. This was the same second act that the Vienna Philharmonic performed at the Granada back in March 2011, and it was a pleasure to hear another robust execution of these wide-ranging, aesthetically challenging works back-to-back. Although the Mandarin Suite has a bit more panache in terms of exoticism and texture, the Wagner carried the day at this particular concert, coming off majestic and breathtaking, especially in the slower movements. Morlot may not be as thoroughly integrated into the symphony’s particular culture and system as Levine was, but he knows how to wind them up, and he delivers a ravishing, full sound that nearly shook the rafters of the Granada, especially on the Bartók. For all the attention it has received lately from major orchestras, one would imagine the Miraculous Mandarin Suite to be the great underappreciated masterpiece of the Hungarian composer’s career, but it’s still too soon to tell if this somewhat bombastic work will replace his Concerto for Orchestra as an all-time audience favorite. Perhaps this is an appropriate time to pause and reflect on the incredible-shrinking-repertoire phenomenon that seems to be plaguing the world of symphony orchestra programming. The increasing repetition, not so much of such warhorses as the first symphony of Johannes Brahms, for example, but rather of exotica like the Mandarin Suite, does seem to indicate a certain herd mentality, even at the highest levels of orchestral achievement. Perhaps if we had gotten one of the other programs that the BSO has been playing, such as the ones that include Elliott Carter’s Flute Concerto, or John Harbison’s Fourth Symphony, there might not be the same sense of inadvertent over-familiarity. Let’s hope that the January 26 appearance of the Royal Philharmonic at the Granada, despite the presence of the Brahms First Symphony, which, of course, really does deserve to be played as often as it is, will provide some respite and restore more of the wonder of surprise to the concertgoing experience.